The study of human evolution and the spread of human beings across the globe fascinates me, so I was drawn to a seminar during Darwin Week 2012 at the College of Charleston called the Ice Age Dispersal of Humans to the Americas. I took copious notes and have been meaning to compile them into something legible, which is what you will find here. I’ve had my DNA tested to determine the path that my ancestors took out of Africa when they left the continent 60,000 years ago, so I had a head start going into this seminar on how humans came to populate North America. The presenter was Ted Goebel from Texas A&M and the Center for the Study of the First Americans. They have an amazing website which will provide much more detail than I can in this brief summary. 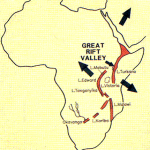 The fossil record along with genetic evidence confirms the origins of Homo sapiens in East Africa approximately 200,000 years ago. Homo sapiens spent the majority of our time on the planet in Africa until around 60,000 years ago when the great migration began. There are some benchmark dates that help us understand the spread of Homo sapiens around the globe and one of the first is in Australia. The earliest archeological finds there are dated between 40,000 and 50,000 years ago, so there is support for the migration of early humans into Australia once they left the African continent. Paleontology, genetics and archeology all confirm humans arrived in Northeast Asia approximately 40,000 years ago. So we can trace this migration of humans out of Africa, with one group heading toward, and eventually settling in Australia, with another group heading into NE Asia. Over the next ten thousand years, humans would make their way west into Europe and meet with Neanderthals there, while another group would follow the mountains north and ultimately east into Siberia. The earliest unequivocal dating of humans in North America is approximately 13,000 years ago. 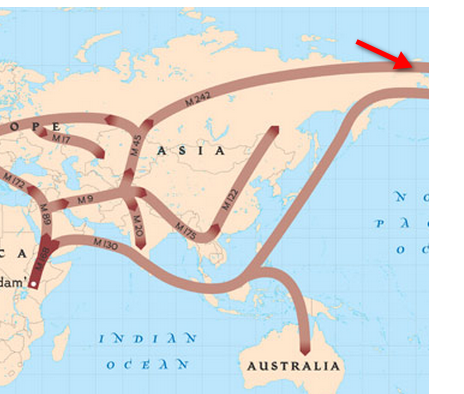 There is clear archeological evidence that modern humans were in what is now the United States at that time and genetic evidence tells us that the indigenous, aboriginal people of North America share the DNA of the people of Siberia. 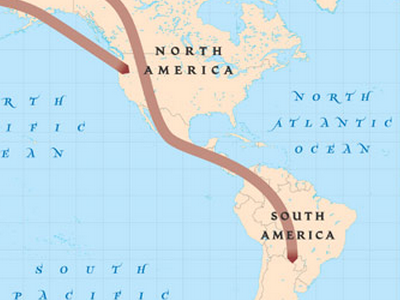 So what does all of this evidence tell us about the migration of humans into North America? During the last glacial maximum, approximately 22,000-24,000 years ago, humans were essentially stuck in Siberia for thousands of years. As a period of warming began, ice sheets that covered all of what is Canada today began to melt. 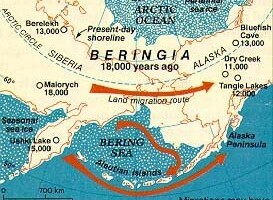 Small populations of humans began to make their way across the Bering Land Bridge, which is now under water. Paleontology and genetics confirm the first humans came through the passage in Alaska between the ice sheets approximately 14,000 years ago and spread across the United States. Genetic evidence shows us that the all major Native American people emerged from the same region of Central Asia, both in their mtDNA and Y-chromosome DNA. Genetics further shows us that all populations of native people, from Alaska to Brazil, share a unique allele at the same location on the genome that implies that they all descended from a single founding population resulting from a single migration. So the earliest inhabitants of North America hailed from Siberia, who ultimately descended from a population of humans who left Africa 50,000 years before them. They crossed the Bering Land Bridge through the mountain passes into Alaska, following mastodon and mammoths all the way into what is now Wisconsin. Some spread across the US and others continued south along the coastline into South America, culminating what is the longest migration of humans in the history of our planet. This subject remains fascinating to me so whenever I see additional studies on the subject, I have to read them. 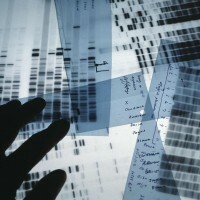 This article in Smithsonian focuses on some of the other theories and the evidence to support them. I’d heard of one of them already; that Europeans found the Americas by boat as long as 20,000 years ago. The evidence for it is thin, but it does exist. There are some archaeological finds dated to 20,000 years ago that match similar archaeological finds in Europe. Much of the evidence that would be required to fully support the theory though is likely lost at sea. The theory I was not as familiar with is that humans arrived in the Americas several thousand years earlier than the Clovis era settlers and probably arrived by sea, traveling the California coast and down into South America.